Three Dog Bakery’s signature dog food lines are specially formulated with the finest ingredients for your best friend. 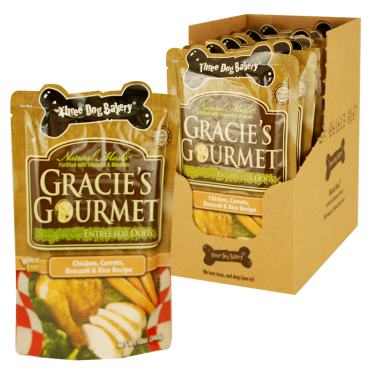 Our Bake to Nature Oven-Baked Food® and Gracie’s Gourmet™ Entrées for Dogs® are made from 100% natural ingredients for 100% complete and balanced nutrition. We don’t add by-products, preservatives, artificial colors or flavors…just wholesome, close-to-the-Earth ingredients for that one-of-a-kind taste dogs just love. We brought food from the dinner table to your dog with our healthy, all-natural dog food Entrees. Packed full of nutritious vegetables like carrots and broccoli, as well as succulent chicken that’s been slow cooked the result is the best gourmet dog food that leaves dogs licking their chops with satisfaction. Chicken, broccoli, carrots, cooked rice, ground flax seed, corn starch, vitamins: [maltodextrin, Vitamin E supplement, niacin (niacinamide), d-Calcium pantothenate, Vitamin A Palmitate, riboflavin, thiamin mononitrate, pyridoxine hydrochloride, folic acid, beta-carotene (source of Vitamin A), Ascorbic Acid (source of Vitamin C*), biotin, Vitamin B12 supplement, cholacalciferol (source of Vitamin D3)], salt, natural chicken flavor roasted concentrate, choline chloride, minerals: [ferrous phosphate, zinc oxide, manganese sulfate, sodium chloride, cupric oxide (source of copper), sodium selenite], potassium iodide. Our all-natural entrées for dogs are slow-cooked, succulent gourmet meals made with 100% natural ingredients; no added sugar, salt or wheat gluten…no artificial preservatives, flavors, colors or additives…just tender meats, tasty veggies and nutritious rice that leaves dogs licking their chops with satisfaction. Fortified with vitamins & minerals it’s all your dog needs for complete and balanced nutrition. 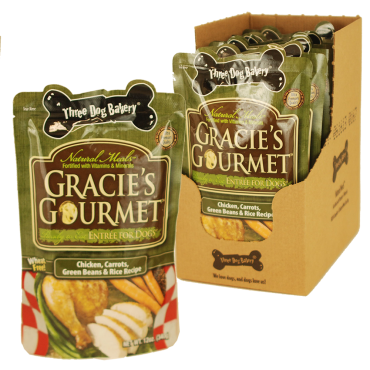 Gracie’s Gourmet™ Entrées For Dogs® are available in two tasty varieties: Chicken, Carrots & Broccoli and Chicken, Carrots & Green Bean formulas. Chicken, rice, carrots, green beans, rice protein concentrate, triacalcium phosphate, ground flax seed, potassium chloride, starch, vitamins: [maltodextrin, Vitamin E supplement, niacin (niacinamide), d-Calcium pantothenate, Vitamin A Palmitate, riboflavin, thiamin mononitrate, pyridoxine hydrochloride, folic acid, beta-carotene (source of Vitamin A), Ascorbic Acid (source of Vitamin C*), biotin, Vitamin B12 supplement, cholacalciferol (source of Vitamin D3)], salt, natural chicken flavor roasted concentrate, choline chloride, minerals: [ferrous phosphate, zinc oxide, manganese sulfate, sodium chloride, cupric oxide (source of copper), sodium selenite], potassium iodide. Wish you had time to cook for your dog but you don't even have the time to cook for yourself?